This playground, situated right near the beach in Seatoun, was upgraded in 2016 and now has a nautical theme. The biggest piece of equipment is a pirate ship with a wobbly bridge, slide, rope ladders and hiding holes. It’s surrounded by sand which kids can also play in. Other equipment includes a crows nest to climb up to using rope ladders, monkey bars, swings of various varieties including toddler, regular and a bucket swing. There’s a seesaw, roundabout and a piece of equipment aimed at toddlers including a mini slide, tunnel, abacus and chain climbing ladder. There are toilets and the playground is right next to a shingle beach which is dog friendly in the winter months (dogs on lead). There’s plenty of seating and a grassy area suitable for a picnic. 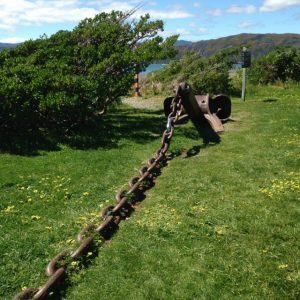 To one side of the playground there’s also a memorial to the Wahine disaster in the form of a huge anchor and chain which provides another thing for kids to climb and slide on. Address: Churchill Playground, Marine Parade, Seatoun. There are a few car parking spots on Marine Parade near the reserve but also closer to the playground on Forres and Monro Streets.